Aztec society had rich traditions of art and culture which extended over hundreds of years. It was influenced by various classical Mesoamerican civilisations and Aztecs themselves also contributed to it. It was very common in Aztec society for people to own works of art and this included the nobles and the commoners alike. Some important elements of Aztec artifacts included stone sculptures, architecture, pottery, metalwork, and others. Other than the classical civilisations, the culture of Aztec artifacts was also influenced by their contemporary neighbouring states such as Oaxaca. The history of Aztec art and artifacts can be traced back to the classical Mesoamerican civilisations. Major civilisations that influenced the culture of Aztec artifacts include the Olmec, Maya, Toltec, and Zapotec civilisations. Toltec in particular is important because in the language of the Aztecs, artifacts and works of art were called “toltecat” since there was no word for art in the Aztec language. The reason for calling works of art “toltecat” was that Aztecs traced their ancestry to a group of people called Toltecs, whose city was destroyed in the 12th century. 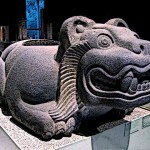 These people had rich artistic traditions and the massive statues of gods in their destroyed city impressed the Aztecs. Perhaps the most famous of all Aztec artifacts is the fired-clay Mictlantecuhtli statue which was discovered by the archaeologists in 1994 while exploring the sacred precinct of Tenochtitlan. This figure is almost 6 feet tall and has much of its skin removed and its liver hanging out. The figure represents the Aztec god Mictlantecuhtli who was the god of death and the ruler of the underworld. The statue has clawed hands and there are holes in its head which some archaeologists think once had human hair of the sacrificed humans since some believe that the worship of Mictlantecuhtli also involved the ritual of cannibalism. The Aztec Calendar Stone, also known as Cuauhxicalli Eagle Bowl, is one of the most well known Aztec artifacts. This stone calendar was carved in 1497 and is dedicated to the sun god. It is 3 feet thick and almost 12 feet across, with a weight of about 25 tones. This masterwork of Aztec artifacts remained buried for over 300 years until it was discovered in 1790. This special Aztec artifact depicts the Aztec understanding of time and space as wheels within wheels. One can also deduce information about Aztec understanding of heavens and how the gods governed the passing of time and days. The carvings contain two calendars which are interrelated in religion and ceremony. 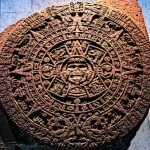 Both calendars aligned after every 52 years and, Aztec believed, it could bring disaster on the world. To ward off this possibility of a great disaster, the Aztecs performed a ritual ceremony known as the New Fire Festival. Another famous Aztec artifact is The Florentine Codex which provides ample amount of information about the Aztecs. This codex is a collection of 12 books that were compiled by Bernardino de Sahagún who was a Franciscan but spoke the native language of the Aztecs. However, a lot that is written in this codex is debated among the scholars as some think Bernardino de Sahagún might have presented a picture that the Spaniards wanted to see. The codex, nonetheless, written in Nahuatl and Spanish languages, provides immense amount of information about the Aztec society, culture, and history. The Aztec Feather Shield, discovered about 300 years after it was made, is a unique Aztec artifact and tells us the importance that was attached to military virtues in the Aztec society. This shield is decorated with a beautiful mosaic of feathers and consists of feather tassels handing down in addition to a feather fringe around it. It also consists of a drawing that depicts a mysterious blue figure against a red background. It is thought that this blue figure represents a coyote since coyote was the patron of elite Aztec knights along with the eagle and the jaguar. However, some have also suggested that the figure could be of water monster Ahuizot found in Aztec mythology. Regardless of the identity of the figure, the shield is a masterwork of art and one of the most notable Aztec artifacts. Famous Aztec ruler Moctezuma II commissioned the construction of his famous throne in order to commemorate the New Fire Ceremony of 1507. This throne was also known as the Teocalli (temple) of the Sacred War. It is a very ornate throne rich in symbolism and due to its artistic nature some have even suggested that it was used only for display and not for sitting. The back of the throne represents an eagle on a cactus, which was the founding myth of the capital of Aztec Empire, Tenochtitlan. Just like every other domain of life, religion and mythology heavily influenced the domain of Aztec culture and art. 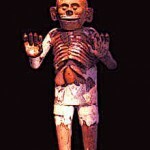 Thus reflection of religious beliefs and reverence for gods is found in almost all important surviving Aztec artifacts. For instance, the Fired-clay Mictlantecuhtli Statue itself represents the Fired Mictlantecuhtli whose worship, it is thought, also included cannibalism as a special ritual. Similarly, the Aztec calendar stone reflects the influence of religion and mythology on the calculation of time and years. Thus while Aztec artifacts certainly reflect the rich cultural and artistic traditions of the Aztecs, they also signify the ritualistic nature of art in the Aztec society. Aztec art was a rich cultural aspect of the Aztec society and had traditions spanning over hundreds of years. Aztec artifacts and the culture of art that produced them were heavily influenced by the classical Mesoamerican civilisations. But other than this influence, Aztecs also contributed various original aspects to this art and produced unique Aztec artifacts of their own. A variety of these Aztec artifacts have been found during various excavations. These Aztec artifacts depict the influence of religion on Aztec art and culture. However, religion alone was certainly not the motivation behind this art but the culture that celebrated art was equally responsible.